Because establishing an accurate cost per order can be difficult in many cases, The Pisa Group uses several different approaches in order to determine accurate pricing. In general, our primary goal when determining the pricing for your call center support or telemarketing services is to discover an accurate and fair compensation for our services. Our pricing process is explained below. To learn more about this pricing information for our call center support or telemarketing services, please contact us by phone or by completing our contact form online. Difficulty of sale, territory restraints, customer pricing, and type of service are all aspects that can have an effect on the cost of marketing our servicing your business. Therefore, the cost of our telemarketing services will vary for each customer based on their market orientation and other specific details. If you are interesting in working with The Pisa Group for your call center support and telemarketing services, we will provide you with an accurate market study of your business objectives in order to best determine your marketing costs and pricing information. First, on any outbound campaign, we will test call your market for FREE for a specified amount of hours. At the completion of this test, you will be sent an analysis of this market study, which includes detailed information such as orders per hour, contacts, close percentages, and more. An accurate and fair cost per sale that is based on actual experience and facts rather than guess work. A flat hourly rate that will give you increased flexibility and allow for easier budgeting of your marketing costs. If you accept our proposed pricing for call center support and telemarketing services and you choose to partner with The Pisa Group, your price can be retroactive to the test campaign. At The Pisa Group, our call center support and telemarketing services can handle all types of transactions. We can develop and implement an effective telemarketing campaign, offer retention services, or manage incoming or outgoing customer service calls. 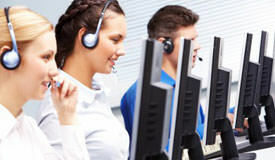 Our complete spectrum of call center support and telemarketing services helps you to reach and stay in touch with customers throughout all stages in the customer lifecycle. If you are interested in working with our telemarketing company, please feel free to learn more about our available outbound telemarketing services or our inbound call center services here on our website. Copyright THE PISA GROUP Inc. - All rights reserved.